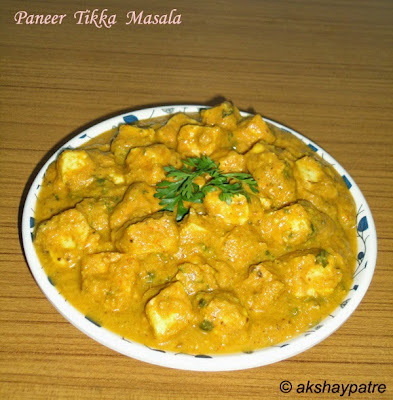 Paneer tikka masala recipe - Today, I am sharing with you all a very famous, North Indian popular paneer tikka masala commonly listed in menu in almost all restaurants. 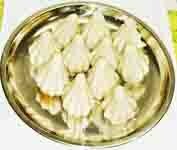 Even in South India, it has gained popularity and any Indian parties are incomplete without this side dish. 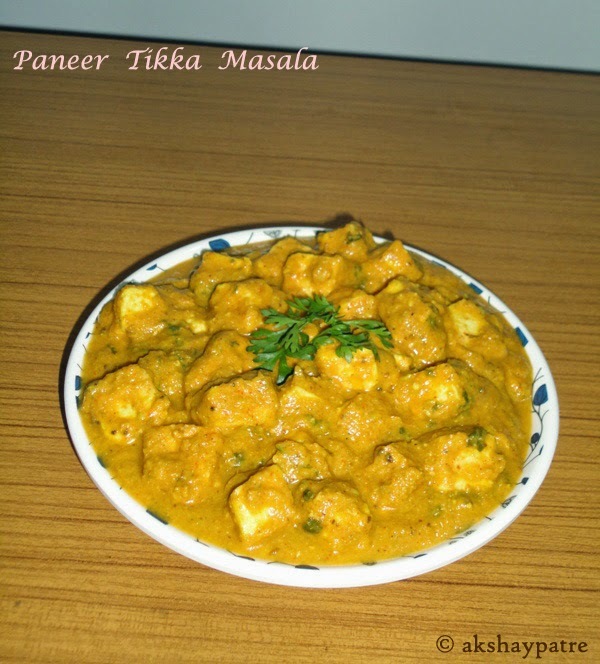 Paneer tikka masala is one of our favorite side dishes. In fact, we like any dishes prepared with paneer, be it paneer tikka, paneer matar paratha, cauliflower paneer paratha or simple matar paneer masala. There are so many versions of making paneer tikka masala, but this one is the most authentic method of preparing restaurant style tikka masala which has inviting aroma with great taste. The only difference between the dish prepared by me and the dish served in the restaurant is that I did not garnish the dish with fresh cream. The smooth and saucy gravy really goes exceptionally well with all Indian flat breads, pulavs and even steamed rice. But, we like it with parathas and phulkas. Wash and soak the cashew nuts in cold water for 15 - 20 minutes. Take strained thick yogurt in a bowl. Add the chilli powder, paneer tikka masala, salt and mix. Add the paneer cubes and mix well. Keep it aside for 15 - 20 minutes. After 20 minutes, heat a non-stick pan and apply some oil on it. Place the paneer cubes along with thick yogurt. Cook the paneer on low flame till golden brown from the bottom. Turn the paneer cubes and cook the other side also till golden brown and set aside. Heat 2 tbsp of oil in a pan, add the cloves, cinnamon, cumin seeds, star anise and saute till they crackle. Add the grated onions and saute. Add the ginger garlic paste, fennel seeds and saute on low flame till the onions become translucent. Once the onions are translucent, add the grated tomatoes and cook covered on low flame till the tomatoes are soft and mushy. Add the garam masala, kashmiri chilli powder, turmeric powder and saute for a minute. Allow it to cool. ground masala paste to a pan. Serve hot with choice of your Indian flat breads. You can also make paneer tikka in the oven. To make the paneer tikka in the oven, skewer the cubes and keep them on a greased tray. Keep the tray in the oven and roast for 5 minutes. After 5 minutes, rotate the skewers and again roast for 5 minutes and set aside. 1. Wash and soak the cashew nuts in cold water for 15 - 20 minutes. Take strained thick yogurt in a bowl. Add the chilli powder, paneer tikka masala, salt and mix. 2. Add the paneer cubes and mix well. Keep it aside for 15 - 20 minutes. 3. After 20 minutes, heat a non-stick pan and apply some oil on it. Place the paneer cubes along with thick yogurt. Cook the paneer on low flame till golden brown from the bottom. Turn the paneer cubes and cook the other side also till golden brown and set aside. 4. Heat 2 tbsp of oil in a pan, add the cloves, cinnamon, cumin seeds, star anise and saute till they crackle. Add the grated onions and saute. 5. Add the ginger garlic paste, fennel seeds and saute on low flame till the onions become translucent. 6. Once the onions are translucent, add the grated tomatoes and cook covered on low flame till the tomatoes are soft and mushy. 7. Add the garam masala, kashmiri chilli powder, turmeric powder and saute for a minute. Allow it to cool. 8. Transfer the tomato onion mixture to a mixer jar. Add the soaked cashew nuts, black pepper and grind it to a smooth paste using 1/2 cup of water. Transfer the ground masala paste to a pan. 10. Serve hot with choice of your Indian flat breads. So rich and creamy masala! Wt ever dish vth paneer msut tastes super tasty...would like to taste this masala vth rotis. Lovely masala dear.made it few days ago.